Want to know one of the few cons of living in furnished on campus housing all four years of college? Starting off furnishing an apartment from scratch. 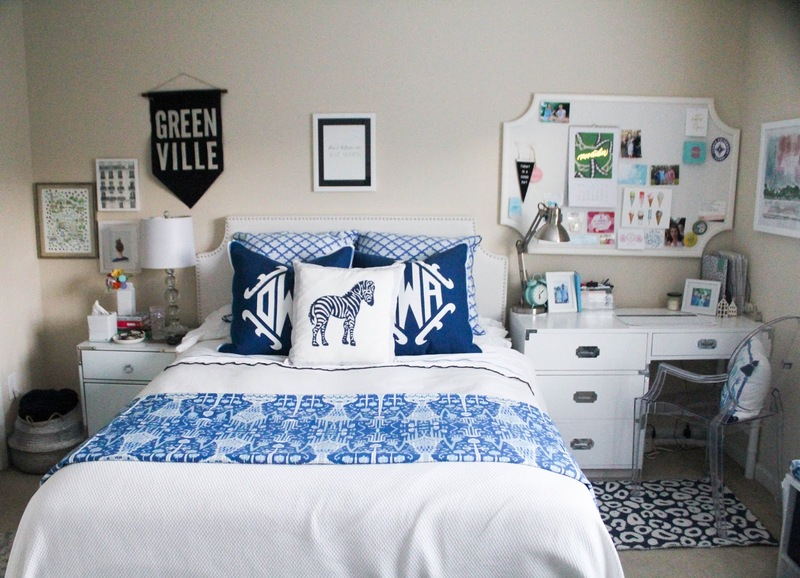 Because of that, this post has been a long time coming and I am so excited to finally reveal my apartment bedroom to y'all! 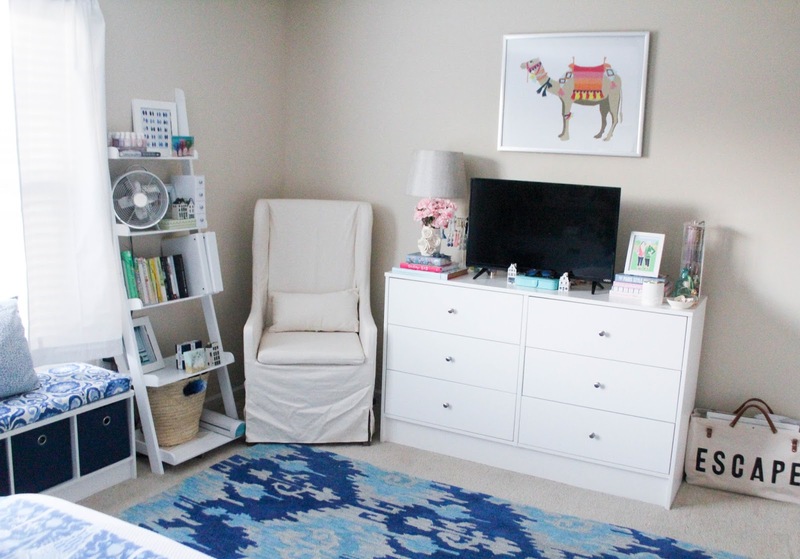 I moved the stuff I did have in during late April and didn't really start furnishing and decorating it until coming back when grad school began in June. For those of you who may just be discovering my site, I graduated from Furman University in Greenville, South Carolina in May with a bachelor's in Elementary Education and am currently living in Greenville teaching fourth grade while also getting my master's in Early Childhood Education. I live in an apartment with two friends from my pledge class near downtown. We have a number of other friends at our apartment complex so it has been a great way to get acclimated to the "real world." Brace yourself for more pictures than you bargained for! Let's start with my favorite part, my bed. If you watched this vlog from over the summer you may remember the struggle of deciding on a mattress (and getting it in my apartment and set up) on my own. There were many questions for my parents about the difference between mattresses that needed box springs and those that didn't so I'm sure they were equally as excited once I finally tackled that to-do. Word to the wise, get your bed frame first because situating a mattress on a bed frame by yourself is not easy! My headboard had been gifted to me by Not Just Dorms and I love the simplistic nature of the white faux leather with silver railheads. The next place I set it up I will definitely nail it up a bit higher so that it is more visible behind all of my pillows but you live and you learn. 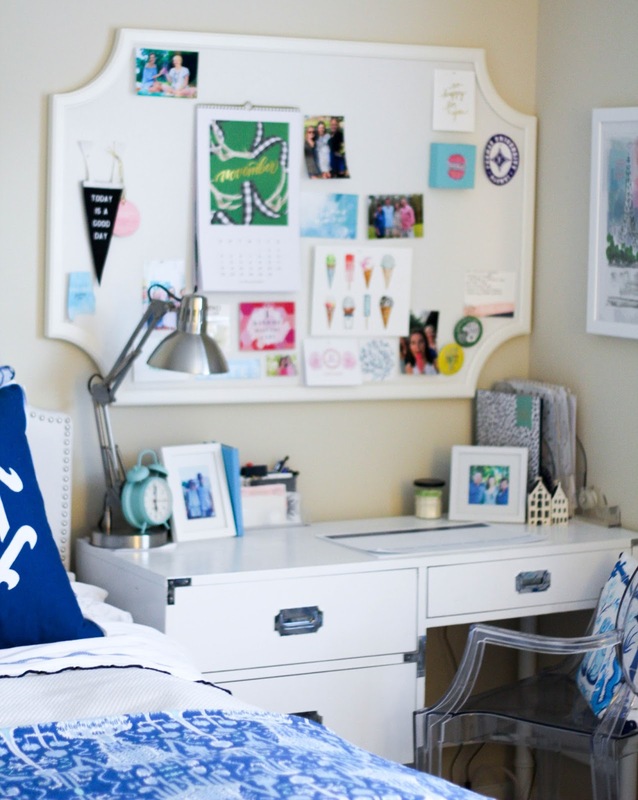 As a lover of symmetry I did not love the idea of having a bed side table on one side and a large desk on the other but with the configuration of my room it definitely worked best this way. 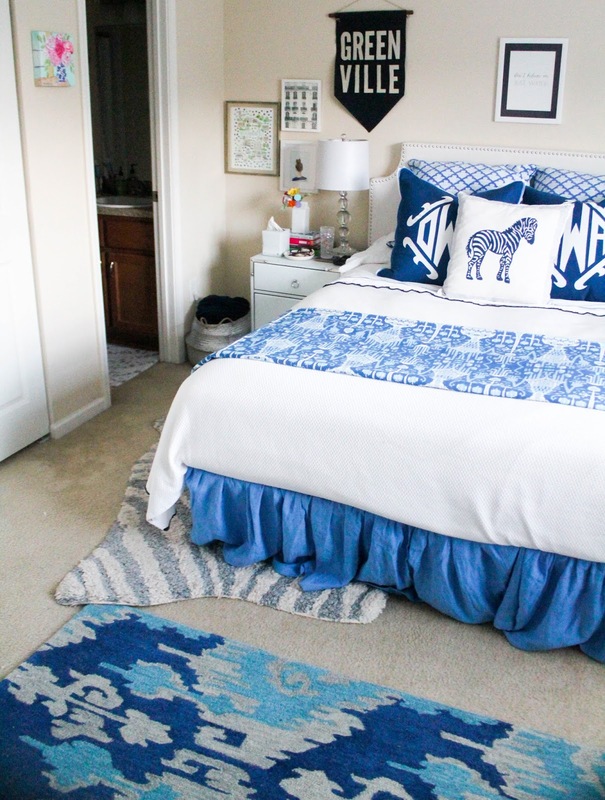 The white with navy scallop quilt was used in my previous apartments (see here and here) but I mixed it up a bit with a new bed skirt, pillow shams, and my favorite duvet cover. Since it hasn't been too cold yet I actually haven't put a duvet insert into the cover but I foresee myself doing that in the very near future. 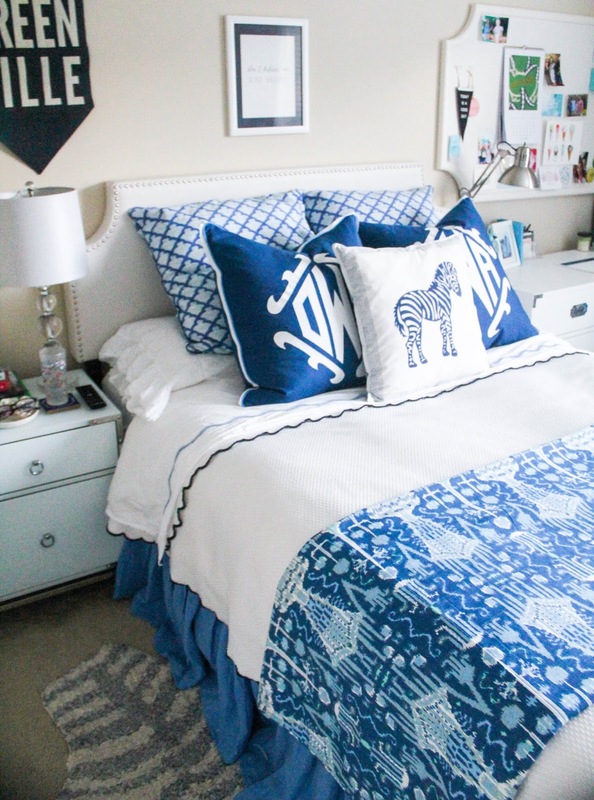 My parents have been transitioning my room at home to be more of a guest room (thanks a lot...) however, that worked in my favor since I was able to take some of the blue and white pieces I loved from there with me to my new apartment. 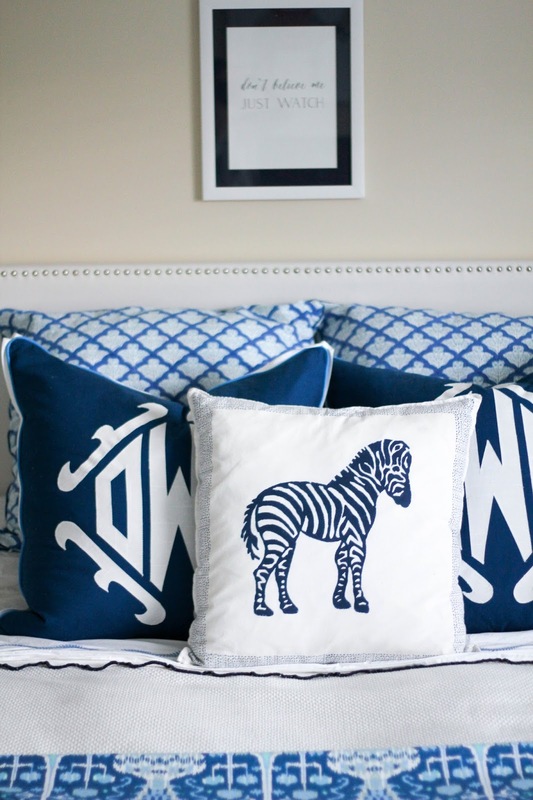 My little in my sorority gave me the most beautiful monogrammed pillow cases that I use on my sleeping pillows and stacked on top of those I have two euro shams from Roberta Roller Rabbit, two from Room 422 (where the duvet is also from), and a throw pillow I found from Waiting on Martha. 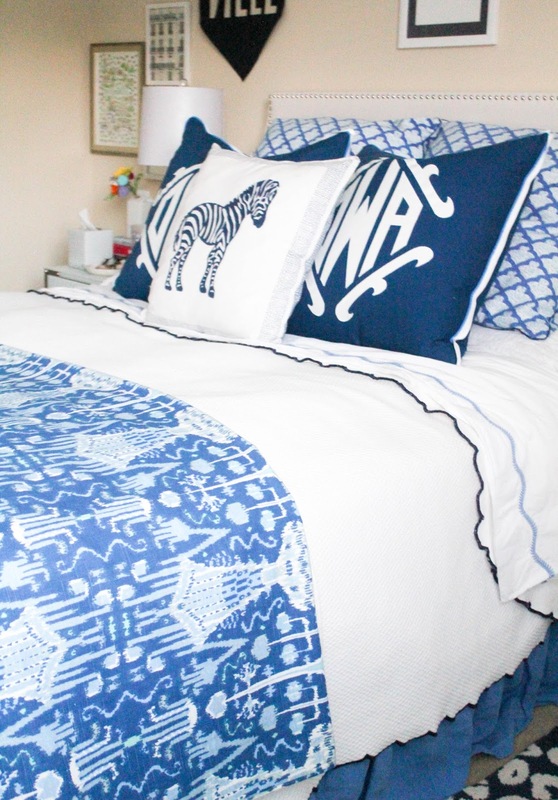 My sheets and dust ruffle are from Annie Selke and I love how they compliment the colors from my patterned pillows. 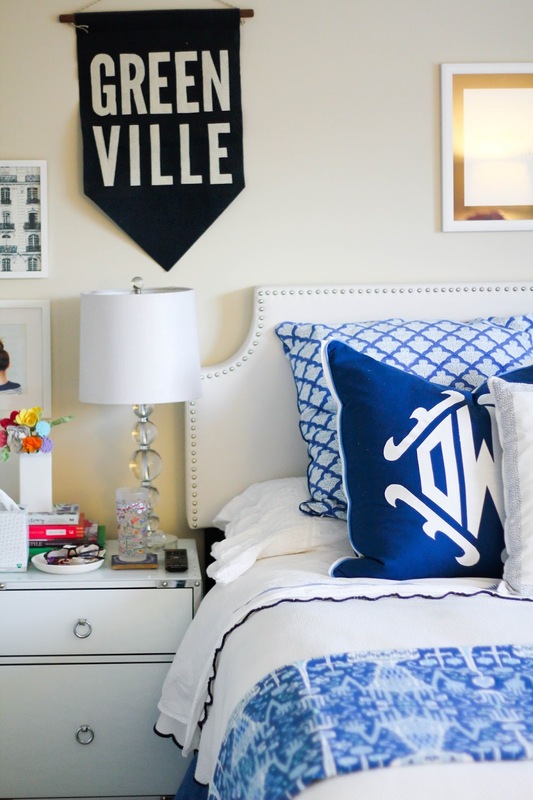 Above my bed is a print that says "Don't believe me just watch" with a navy matte from Mackenzie Horan's old boutique. 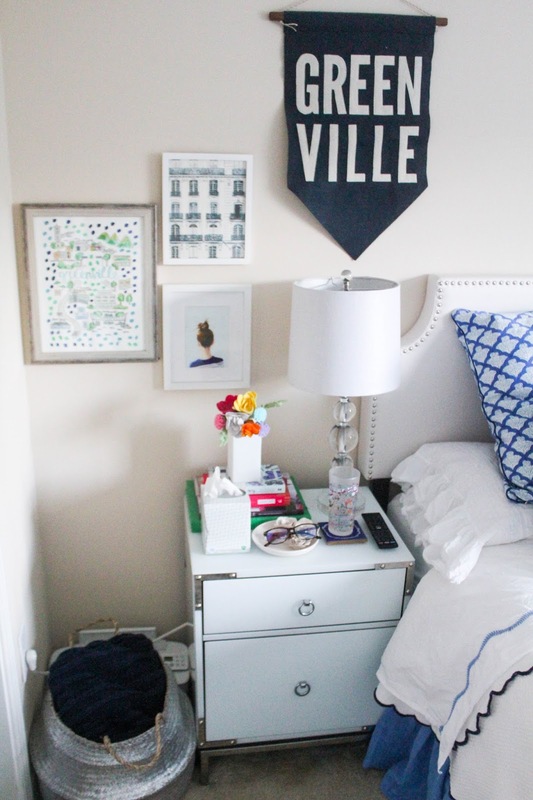 I knew that I wanted to incorporate that into this bedroom as well since my parents included a nod to it in a letter they wrote me senior year of college. In they stated "The poster you have that says 'don't believe me just watch' couldn't be more accurate in describing your approach to challenges. We are proud but never surprised at your drive and what you accomplish." Letters from people have always been special to me so looking at that often reminds me of that sweet note from them. Next to my bed on the left when you are looking at it is my nightstand. After finally making the decision to use one night stand and a desk on the other side, my original nightstand came in damaged so the company sent me a second so I ended up with two regardless. 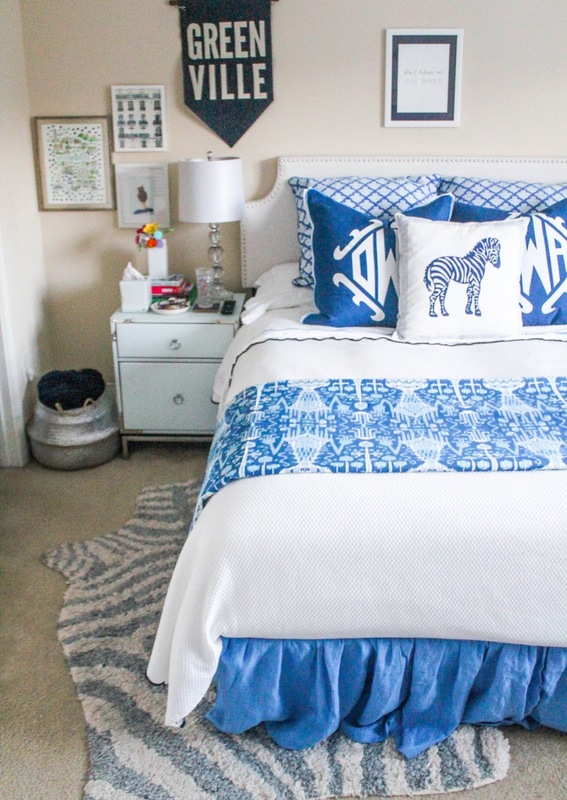 This will be nice in the future if I want matching night stands since I could hide the damaged one on the far side of the bed and have the symmetry I love back. I knew I needed something with a bit of storage and fell in love with the campaign look that these gave which coordinated well with my desk. On the nightstand I have some books, a lamp, tissues, a cup for water, and a little dish that keeps odds and ends altogether. 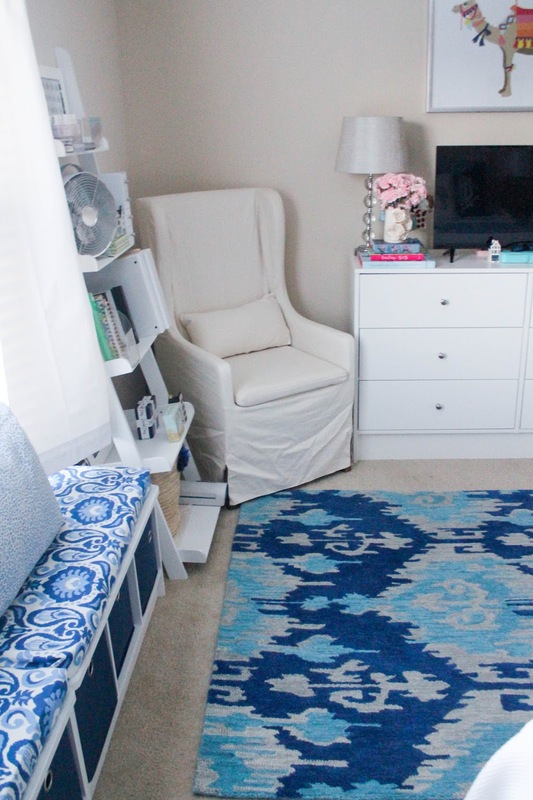 Between my bathroom door and bed I chose to put the rug I used in my previous bedrooms. 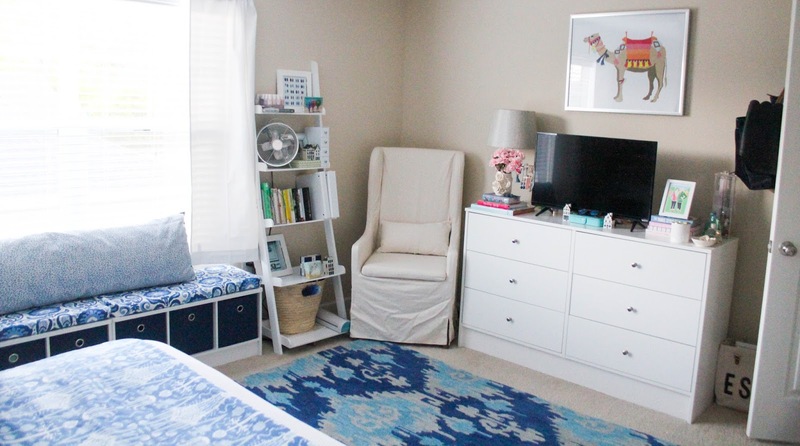 I love the unique style of the grey, zebra-shaped rug and personally think that it compliments the silver and white around my room well. Since there was still a bit of space between the nightstand and the wall I found this cool silver basket that I keep blankets (and my hair dryer) in which is strategically hiding my printer. 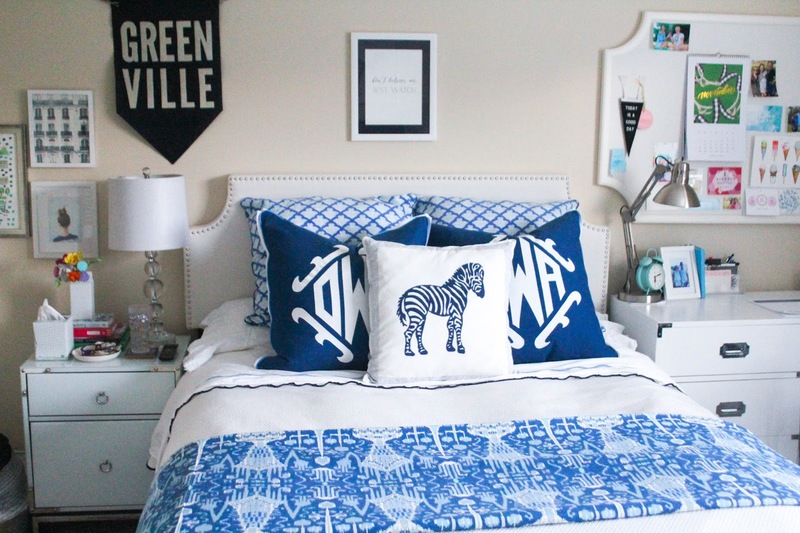 As for art over here I did my best to balance either side of the bed and did so with this navy Greenville pennant, Evelyn Henson's map print of Greenville, a picture of a Parisian facade, and a girl wearing stripes and a bun. All of this art was from previous apartments as well, but I had a good time mixing the pieces in different ways to make it feel updated. Now for the other side of my bed, where my desk is. I have loved the style of campaign furniture and ended up pinning a number of rooms with furniture of this style before purchasing anything for my apartment. I happened to see a campaign desk on Craig's List and jumped at the opportunity to have it in my room. It took a bit of cleaning up (and a fresh coat of paint) to get it looking right but was completely worth it in the end. 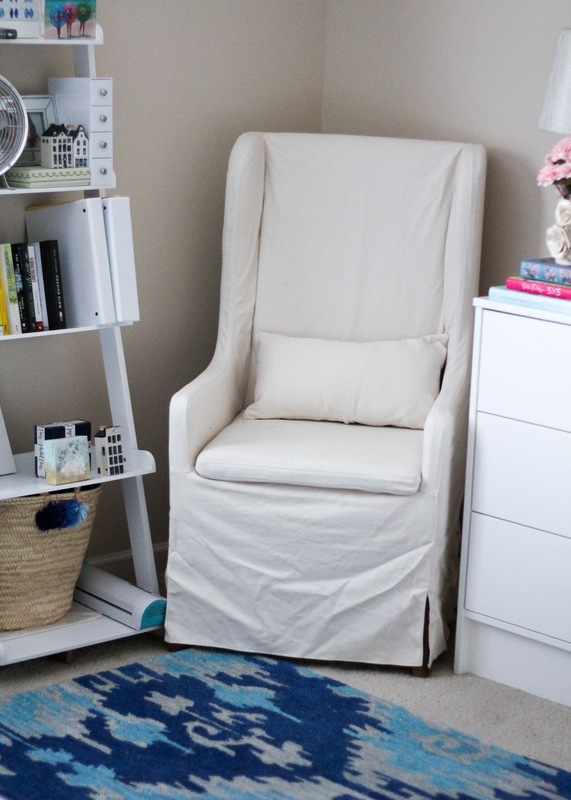 I had used a ghost chair at school and found it to be comfortable so I continued to use one here as well (my cute Navy PB teen chair gets much more use at my desk in my classroom). 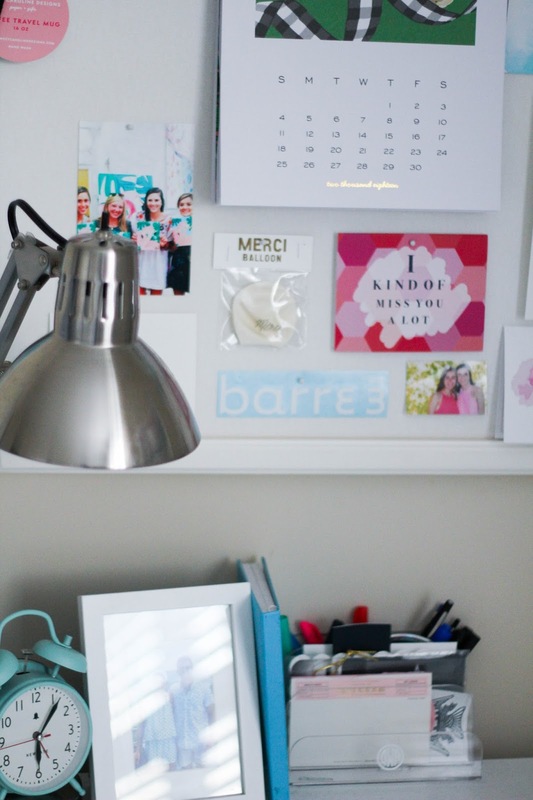 Above my desk is a pretty white scalloped pin board from PB Teen that holds a calendar, pictures of some of my favorite people, notes, and other little things that are fun to have on display. Next to that is another PB Teen find from one of my favorite artists, Evelyn Henson. The colors of the piece are soothing which is calming for an area where I am aiming to get a lot done. 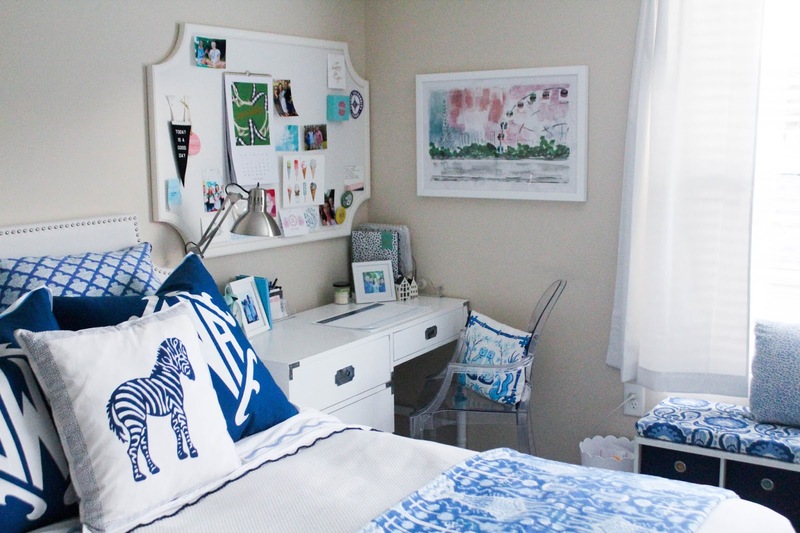 On top of my desk I have some acrylic organizers to avoid a big mess, an alarm clock, pictures of my family, and two cute ceramic houses that my mom and I collect which I have to thank for my love of blue and white! Figuring out what to do with the space under my window ended up being more of a challenge than I anticipated. 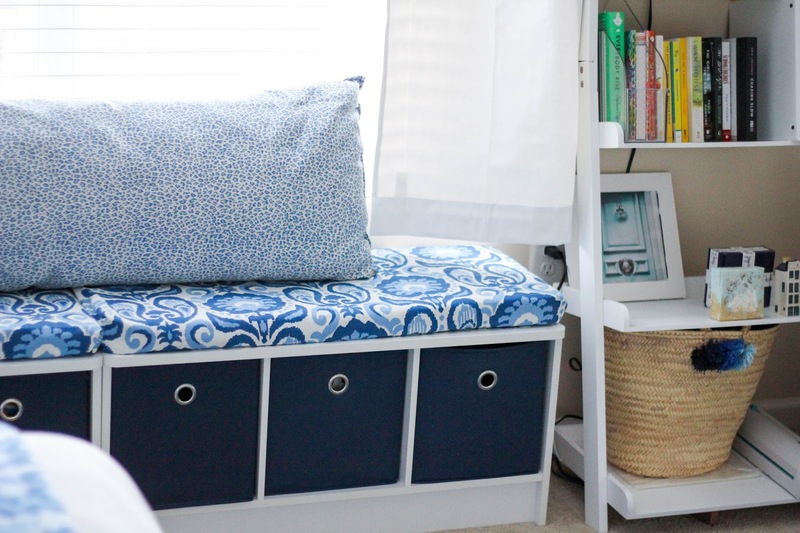 Once I stumbled across the bench version of my favorite storage furniture I had the perfect idea, a window seat! 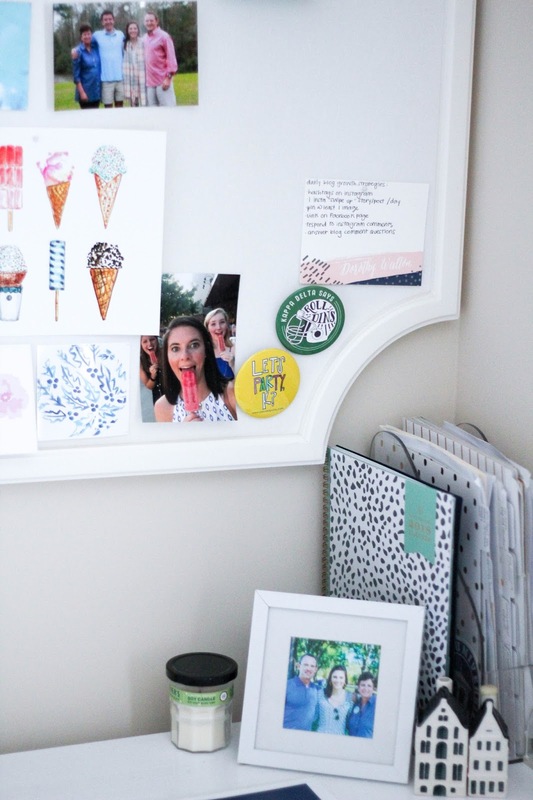 Having this area double as a place to set and store things became a real game changer. 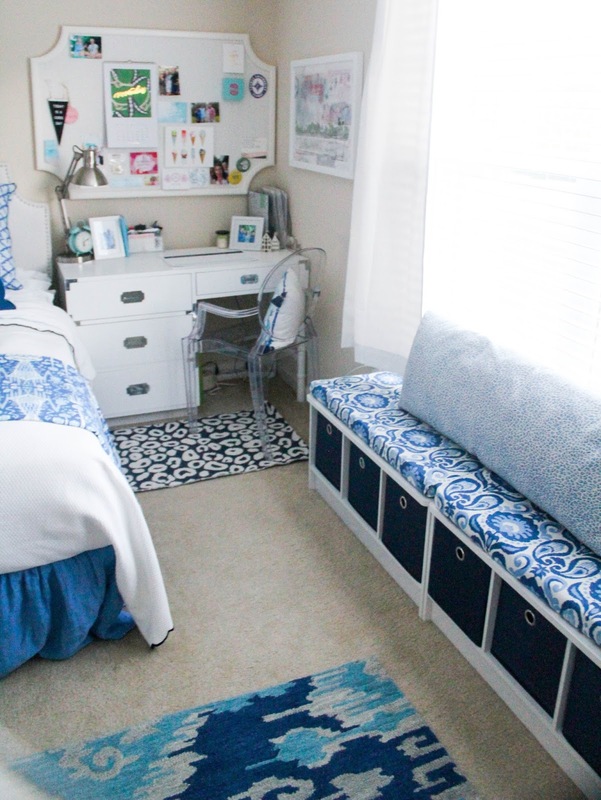 I was even able to incorporate fabrics from my previous apartments on the bench. 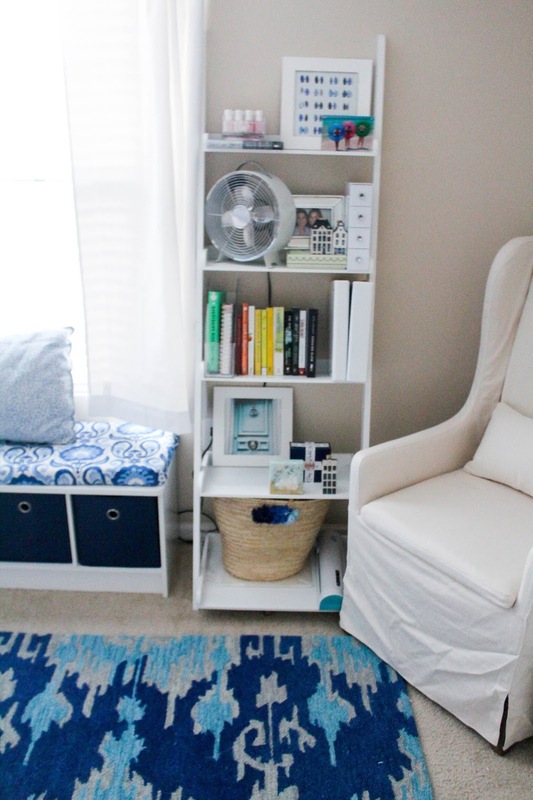 The navy cubes I had from other similar storage furniture and I definitely think it helped to tie things together. Purchasing blackout curtains was so necessary and I'm not sure what took me so long. At the beginning of the school year the sun would stream in and wake me up before 6:00 and I'm pleased to report I no longer have that problem. Next to the two benches (that I pushed together to look like one) is a bookshelf that I had in my apartment senior year. 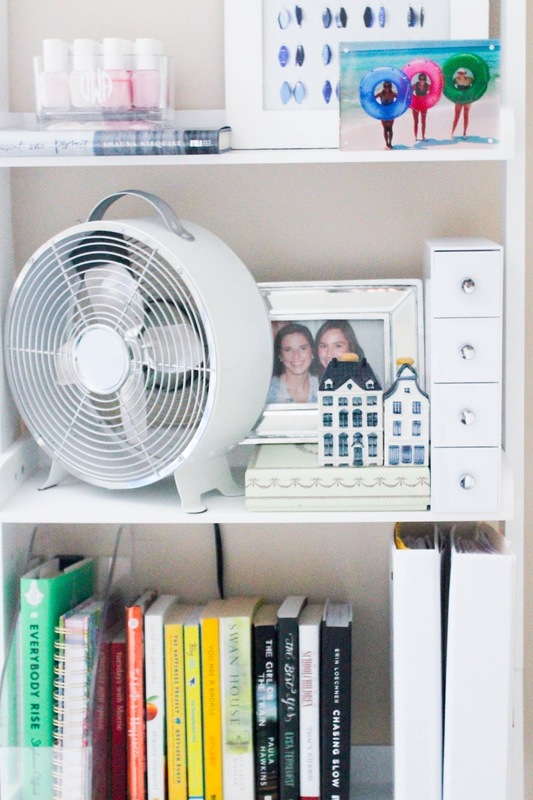 I initially thought this would make its way to my classroom but having a shelf for my books and knickknacks in my apartment became more of a necessity than I thought. Now that I have a chair next to it I am so glad that I kept it in my room. And now for the final area of my room. Another one of the pieces that I purchased pretty early on was my dresser. Despite having the master bedroom, I have the smallest closet and knew I would need a place to store folded clothes. I found the dresser at Ikea and would love to eventually update it with cuter pulls but for now it works. My grandparents had an extra smart TV that they offered me that I decided to put in my bedroom. I've never had a TV in my room before and boy am I a fan. Saturday morning blogging in bed with Netflix on and a hot cup of coffee is pretty amazing. Displayed on my dresser are some books, jewelry organizers, and a couple of candles. Figuring out what I wanted to hang above the dresser took some time as well. 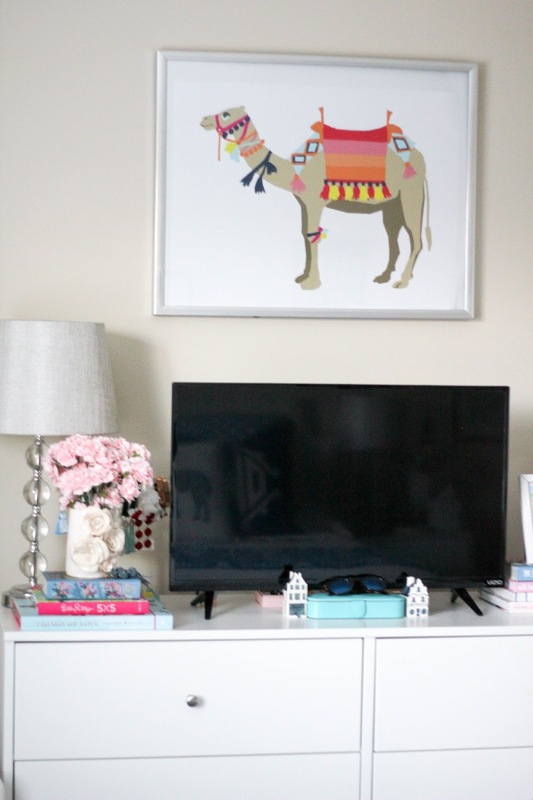 When I saw this Katie Kime camel print I was sold. 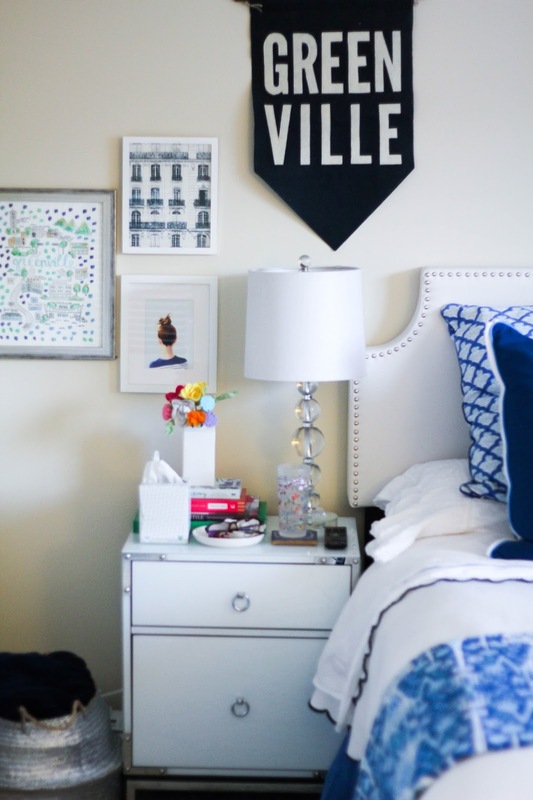 The navy accents and colors were the perfect addition to that large, blank wall. I framed Camela in a silver poster frame I found at At Home and called it a day. In front of my dresser I have a rug that I had in my bedroom at home. 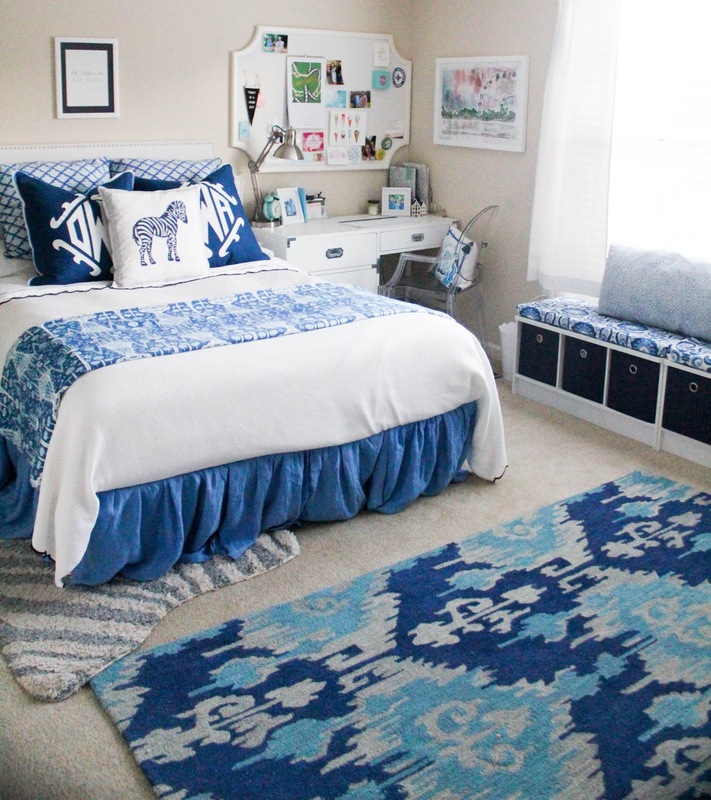 I love the ikat style of it and the way it incorporates some different shades of blue (as if I needed anymore). So there you have it, my humble abode. I am so sorry that it took so long for me to finally get around to posting this but hope it gives any of you in the process of decorating a space some optimism about the long process being worthwhile! 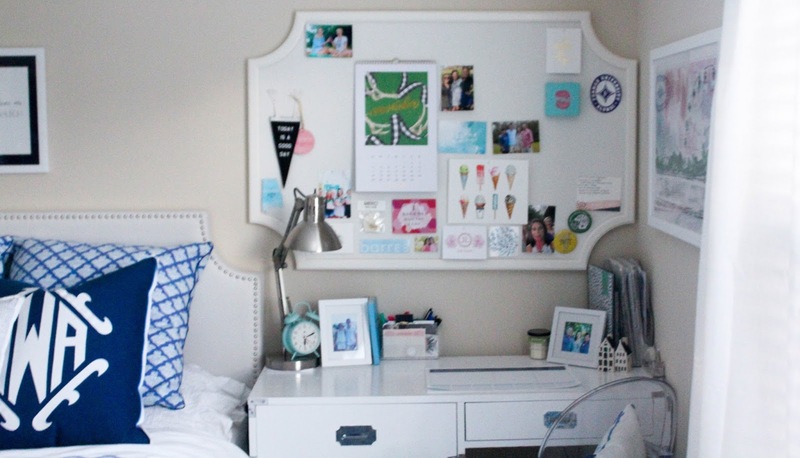 This space is so amazing and I love your personal touches. 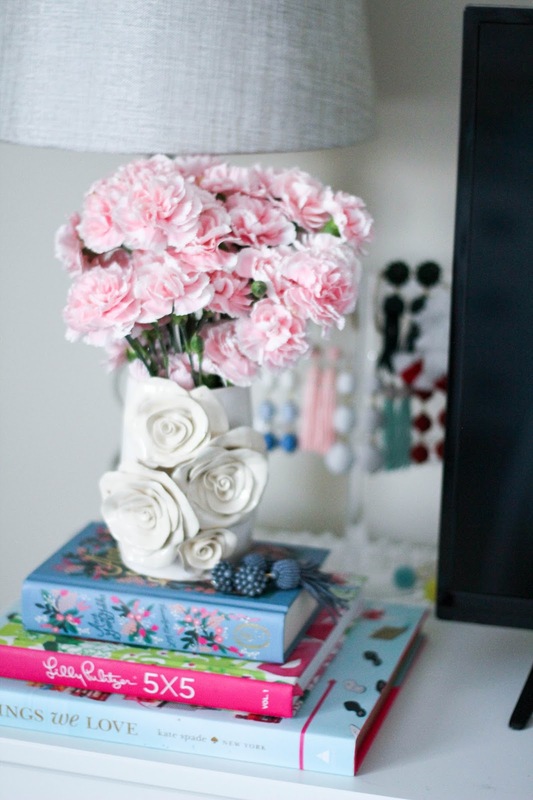 This really inspires me with confidence for when I move out & I can't wait to start decorating!